Fr. Kakichi Kadowaki is a Japanese citizen and a member of the Japan Province of the Society of Jesus. He joined the Society of Jesus in 1950, and was ordained a priest in 1960. He was for many years a professor in the department of Philosophy at Sophia University, and for a time he was director of the Institute of Oriental Religions. Among his well known publications is Zen and the Bible a book dealing with the relationship between Zen Buddhism and Christianity. Among his well known publications is "Zen and the Bible" a book dealing with the relationship between Zen Buddhism and Christianity. He is a well known Zen Master and is noted for the The Zen-Ignatian Training Program that he regularly conducts every year, at his center located at Prefecture of Gunma, Kitakaruizawa in Japan. For the past thirty years as a Jesuit priest, I have been making efforts to combine Zen Style meditation harmoniously with Ignatian Spirituality. I believe that I have been able to accomplish this to a certain extent, and so I decided to offer this program to more people, especially Jesuits. In 2001, I directed the first stage of the program for three priests and one nun, who have come to understand and experience the fact that Zen meditation and training could greatly help them to deepen their Christian prayer. In 2002, the three of them participated in the second stage of the program. In 2003, the third stage of program was completed. Fr. Diosinio Ramos O. Carm who has finished the entire program, has been recognized as a Zen teacher. (Please refer to the whole course of this earlier program that I have described below). In 2004 I started a new program focusing on St. Ignatius’ Spiritual Exercises. During my long period of Zen training I have always borne in mind the idea of synthesizing Zen and Ignatian Spirituality, and so the new program is just what I have desired to do for long time, that is to say, it is my dream so to speak, inspired by the Lord Jesus Christ. During the period 2006-7, I directed a two years course, an international Zen-Ignatian training program for two Jesuit priests and two nuns, and during 2008-9, I directed a two-year program of the same type for four nuns and a laywoman. Now, in the summer of 2012, I intend to proceed with the second year of the Program, and I would like to invite you all to participate in this. The first stage of this program will be in Kitakaruizawa (located in the Gunma prefecture of Japan), from July 25 to August 26, 2011. The aim of this first stage is an “initiation” to deepen Christian prayer, using the Zen breathing method. It is founded in Genesis 2-7, which speaks of the creation of man through the breath [ruah, Spirit] of the life of God (the Holy Spirit), for by getting a knack of the Tanden-koku (or breathing with the guts), you will experience the close relationship that lies between breathing and the Holy Spirit, in order that you may acquire an insight into the realization within you of the ‘Principle and Foundation’ (Ex. 23), with a spiritual eye (a kind of Christian Satori). Then, over this Principle and Foundation, we will try to build up a firm Ignatian Spiritual “Exisitenz” using a Christian Koan, (which is a Zen term meaning a puzzling question that the Master gives his disciple, in order to lead him into enlightenment). We will deal with each stage of the Spiritual Exercises, and specially the five fundamental Exercises, namely the call of Christ the King, the two Standards, the three Classes of people, the three modes of humility, and the Contemplation to obtain Love. During the whole Program we will always pay special attention to the rules for the discernment of spirits, and refer to both St. Ignatius’ Autobiography and other related matters. 1)July (25-31), 2010: Initiation period, to learn intensively the method of breathing. 3)August (4-11): The Setshin continues with Japanese disciples of the Community of the Way. 5)August (13-19): The second Setshin. Its target is the realization of sinfulness and the fact that we are dust. The location is in the northeast of Mount Asama, altitude 1050m, and the climate is dry all the year round, pleasant and healthy, and cool in summer. There are 15 rooms: 5 western style rooms, 9 Japanese style rooms (including a Japanese Tea room and a Zen meditation room), three living rooms, four kitchens, with four refrigerators, three bathrooms, and a wide veranda (17.6m), a large meeting room (with a plasma TV set and a theater surrounding system). Nearby there is a hot spring facility, which has many types of hot springs, two types of saunas, and a 25m swimming pool. We can use it everyday with a membership card. It is an ideal setting for prayer and Zen-practice. The weather is cool and dry in August, and chilly around the end of September, and it is surrounded by forests and rivers. 1. Persons who eagerly want to deepen the Ignatian Spirituality. 2. Persons who earnestly wish to respond to Christ’s call to join Him in saving the whole of humankind “with great spirit (grand animo) and generosity (liberalidad)” (Ex. 5). 3. Persons who strongly desire to develop the capability of sitting in the half lotus-position. 5. Persons who can participate in both the 2011 and 2012 programs. Cost: Twenty US dollars per day plus travel expenses from Tokyo to Kitakaruizawa, from Kitakaru (about 120 dollars for each year). N.B. If I do not receive at least two or three participants the program will be cancelled. Fr. Kadowaki is the author of “Zen and the Bible”(published by Orbis), and many books published by Iwanami Publishers (the most academically appreciated publisher in Japan). He graduated from Tokyo University (BT) and the graduate school of Gregorian University (Rome). 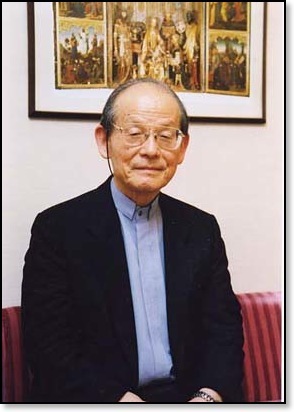 He is a Jesuit Priest with a PH.D. and a Professor Emeritus of Sophia University in Tokyo, and a Zen Master who is recognized by the Zen Master Oomori Sogen who is the former President of Hanazono University (of the Rinzai sect) in Kyoto. 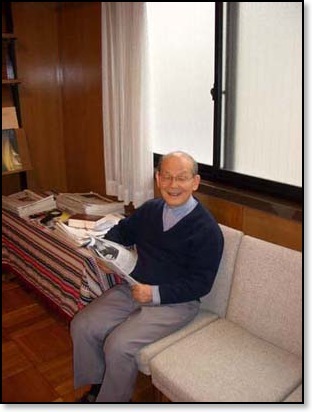 He was an Instructor at the international Jesuit Tertianship that was held in Japan in 1982. He was raised with a Zen Buddhist background and later baptized a Christian by Fr. Dumoulin SJ, a great Buddhist scholar. After entering the Jesuits he was trained by Fr, Pedro Arrupe, the late Superior General of the Jesuits. 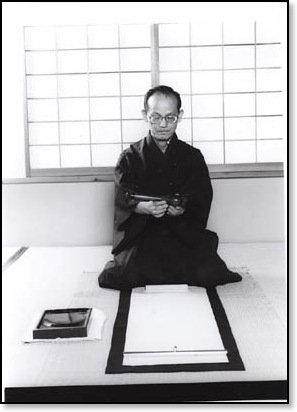 As he deepened his understanding of Zen and Christian Spirituality through more than ten years of study and practice of the above-mentioned Zen training and simultaneous training in the Spiritual Exercises of St. Ignatius, he become increasingly aware of the similarity between Zen and Ignatian Spirituality, and so he was able to write Zen and the Bible and to translate the Spanish Spiritual Exercises into Japanese, and publish them through Iwanami publishers as a pocketbook. He is the author of many academic books. He is also a playwright who has written two Christian No plays. They were staged several times at the national No-theater in Tokyo and St. Ignatius Church in Tokyo, and also at the Argentinian Theater, at St. Ignatius Church in Rome, and at the Royal Church in Brussels. A portion of the No play “Baptima Christ” was staged in the presence of the Holy Father.